So, I’m starting to get somewhat more normal and knitting has begun again. A little. Somertimes. Because it’s little hit and miss I need a certain kind of project, many pieces of criteria to meet. 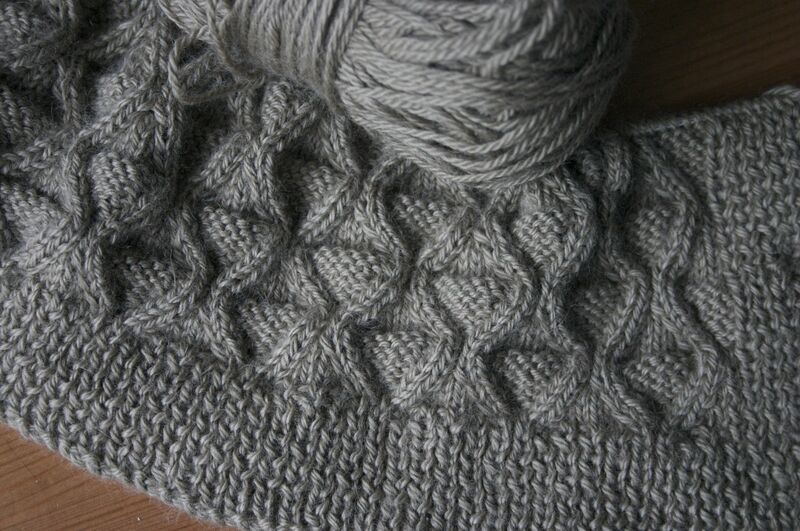 This project has to be easy enough that I can memorize the pattern and really, little or no counting is best. I have a bit of a knack for pattern memorization so that doesn’t rule out a whole lot but it does elimate garments for now. Anything with increases and decreases is out, too much thought and too much possibility for disaster. There is nothing worse than getting to the part of a sleeve or back where the pattern says: decrease/increase 1 stitch at eather side of the next and every 6th row. Then having to put said project down for an extended period of time. I’m not saying I CAN’T pick up a project like that again but it gets a little annoying to pick up and put down multiple times in a week. So, I decided to pick back up a lovely scarf I started last summer on my trip to Winnipeg. 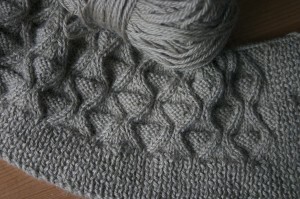 Why I haven’t finished it yet is pretty simple: it’s a 28 stitch gauge, cables every other row, on 2.75mm needles. It’s not the fastest project on earth. At this moment though, I don’t really care, I really just want to keep my hands busy and finish a most sumptuous scarf for winter. This scarf is certainly a little luxurious treat too, the yarn is probably the most soft and stunning yarn I’ve ever seen. It’s so fine, soft like buttah, and comes in lovely soft shades. Even though this scarf is on tiny little needles, I think it’s worth it. The scarf just wouldn’t be the same if it were looser or chunkier. I love it! It’s still a work in progress but I’m taking it with me on my camping trip so hopefully I’ll make some serious progress. This entry was posted on Thursday, July 22nd, 2010 at 9:27 pm	and is filed under Uncategorized. You can follow any responses to this entry through the RSS 2.0 feed. Both comments and pings are currently closed.